The sport of Biathlon has its roots within the Norwegian military and has its main participation base within Nordic countries. Top biathletes are amongst the fittest athletes on the planet, famed for controlling their heart rates enabling them to compose themselves between the skiing and shooting phases. 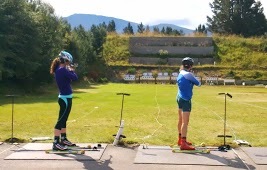 The sport is a unique combination of strength, physical fitness and endurance, with the skill, finesse and millimetre precision needed in rifle shooting. A biathlon competition consists of a race on a cross-country track where the total distance is broken up by either two or four shooting rounds, half in prone (lying) position, the other half standing. Extra distance or time is added for each of the targets a competitor fails to hit. In the UK due to the lack of year round snow, snow skiing is replaced with roller skiing. Roller skis are designed to closely match the action and performance of skis enabling athletes to train all year round in warm weather conditions. All of the Biathlon courses at Glenmore Lodge are delivered by Mike Dixon MBE BEM, Britain’s most successful Biathlete and 6 x Olympian. Mike frequently works with the GB team, is one of the UK’s top coaches & is regularly found commentating on Eurosport’s coverage of Biathlon and cross country skiing events. It’s the equivalent of Steve Redgrave teaching you to row…it just doesn’t get any better. Another fantastic course with Mike Dixon. His expert coaching has moved my shooting and rollerskiing massively forward. Great course, great instructor, great accommodation, great location. This was a repeat visit for us and we'll definitely be back again.